We have another big dev update! A week has passed since our last update and we’re back with another update that gives you fine grained control over which promos your Administrators can see. 4. Checking the “Modify Promos” checkbox enables Promo access. Unchecking that checkbox will disable all Promo access. 6. 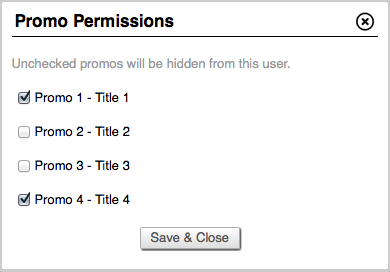 With “Modify Promos” enabled, click the “set promo permissions” link. 7. A window will popup with a list of all of your promos. Uncheck the box next to all promos you want hidden from this Administrator. Click Save & Close. 8. When your Administrator signs in, all promo lists will get filtered to only show promos you have given them permission to view. I wish I could say that the blog had a week as exciting as the production team, but that is not the case. We have been working hard, writing and recording, but overall it was a week like any other. We did decide to take a break from our podcast, but another new episode will be available by the end of next week. That’s all we have this work week. Be sure to check in over the weekend for another industry spotlight, as well as the latest job board update.